M 870 Tube Microphone Cable (ELA M 270)M 870 Tube Microphone Cable for the ELA M 270Made in the USA by Accusound, the M 870 cable features high-strand count quad oxygen free copper conductors sealed in an audiophile-grade, low loss polyethylene insul..
M 900 Tube Microphone Power Supply (CU-29)Power Supply for CU-29..
M 901 Tube Microphone Power Supply(AK-47mkII, AR-51)Power Supply for AK-47 MkII, AR-51 or M16 MkII with Polar Pattern Switch..
M 901A Tube Microphone Power Supply (AK-47 MkII, AR51)Power Supply Upgrade for AK-47 MkII, AR-51, or M16 MkIITELEFUNKEN Elektroakustik's premium power supplies feature the traditional styling of vintage Austrian models, partnered with the improvement..
M 901S Dual Tube Microphone Power Supply (AK-47mkII, AR-51)Dual Power Supply for (2) AK-47 MkII, AR-51 or M16 MkII with (2) Polar Pattern SwitchesDual Power Supply for (2) AK-47 MkII, AR-51 or M16 MkII with (2) Polar Pattern Switches. TELEFUNKEN Elek..
M 910 Tube Microphone Power Supply (C12)Power Supply for C12 with Polar Pattern SwitchPower Supply for C12 with Polar Pattern Switch. TELEFUNKEN Elektroakustik's premium power supplies feature the traditional styling of vintage Austrian models, partn..
M 910S Dual Tube Microphone Power Supply (C12)Dual Power Supply for (2) C12 with (2) Polar Pattern SwitchesDual Power Supply for (2) C12 with (2) Polar Pattern Switches. 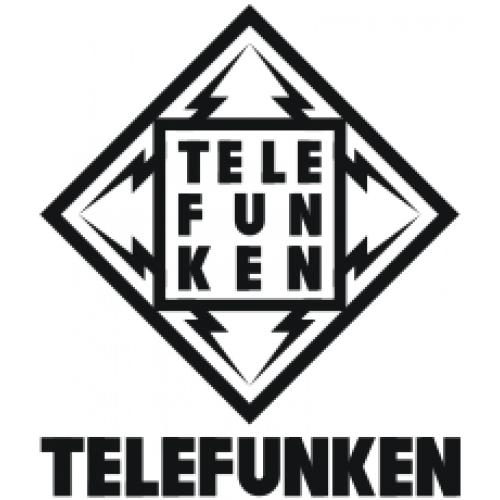 TELEFUNKEN Elektroakustik's premium power supplies feature the traditional styli..
M 940 Tube Microphone Power Supply (U47)Power Supply for U47/U48 with VF14 or VF14KPower Supply for U47/U48 with VF14 or VF14K. TELEFUNKEN Elektroakustik's 940 Series premium power supplies feature the traditional styling of the original Neumann NG u..
M 940S Dual Tube Microphone Power Supply (U47)Dual Power Supply for (2) U47/U48 with VF14 or VF14KDual Power Supply for (2) U47/U48 with VF14 or VF14K. TELEFUNKEN Elektroakustik's 940 Series premium power supplies feature the traditional styling of t..
M 950 Tube Microphone Power Supply (ELA M 251)Power Supply set up for ELA M 250/251Power Supply set up for ELA M 250/251. TELEFUNKEN Elektroakustik's premium power supplies feature the traditional styling of vintage Austrian models, partnered with th..
M 950E Tube Microphone Power Supply (ELA M 251E)Power Supply set up for ELA M 250E/251EPower Supply set up for ELA M 250E/251E. TELEFUNKEN Elektroakustik's premium power supplies feature the traditional styling of vintage Austrian models, partnered w..
M 950ES Dual Tube Microphone Power Supply (ELA M 251E)Dual Power Supply for (2) ELA M 250E/251EDual Power Supply for (2) ELA M 250E/251E. TELEFUNKEN Elektroakustik's premium power supplies feature the traditional styling of vintage Austrian models, p..
M 950S Dual Tube Microphone Power Supply (ELA M 251)Dual Power Supply for (2) ELA M 250/251Dual Power Supply for (2) ELA M 250/251. TELEFUNKEN Elektroakustik's premium power supplies feature the traditional styling of vintage Austrian models, partner..
M 960 Tube Microphone Power Supply (ELA M 260)Power Supply for ELA M 260..
M 962FS Tube Microphone Power Supply (ELA M 260)Dual Battery Power Supply for ELA M 260 Field Set..
M 960S Dual Tube Microphone Power Supply (ELA M 260)Dual Power Supply for (2) ELA M 260 or CU-29Dual Power Supply for (2) ELA M 260 or CU-29. TELEFUNKEN Elektroakustik's premium power supplies feature the traditional styling of vintage Austrian model..
M 963 Tube Microphone Power Supply (ELA M 260/ CU-29)3 Channel Power Supply for ELA M 260 / CU-293 Channel Power Supply for ELA M 260 /CU-29. TELEFUNKEN Elektroakustik's premium power supplies feature the traditional styling of vintage Austrian model..
M 967 Tube Microphone Power Supply (U67)Power Supply set up for U67Power Supply set up for U67. TELEFUNKEN Elektroakustik's premium power supplies feature the traditional styling of vintage Austrian models, partnered with the improvements of modern c..
M 970 Tube Microphone Power Supply (ELA M 270)Power Supply set up for ELA M 270 with Left & Right XLR outputs.Power Supply set up for ELA M 270 with Left & Right XLR outputs. TELEFUNKEN Elektroakustik's premium power supplies feature the trad..
M 970AR Tube Microphone Power Supply (AR-70)Power Supply set up for AR-70 Stereo mic featuring one variable polar pattern channel and one fixed channel.Power Supply set up for AR-70 Stereo mic featuring one variable polar pattern channel and one fixe..
ELA M 260 tube mic amp bodyELA M 260 tube microphone amplifier body & wooden box only. Capsules, Cable or Power Supply not included.TELEFUNKEN Elektroakustik’s small diaphragm ELA M 260 is arguably one of the industry's finest acoustic and classi..
M60 FET AMPLIFIER BODYM60 FET Microphone Amplifier Body (no capsule, no accessories)With over a year and half of development and beta testing with top recording engineers, the newly designed M60 FET (Field Effect Transistor) small diaphragm microphon..
M81 head grill HD03-BKNKM81 head grill BLACK NICKLE..
M80 BLACK head grill HD03-BLKM80 replacement grill BLACK..
BLUE head grill HD03-BLUEM80 & M81 head grill BLUE..
M80 CHROME head grill HD03-CROMM80 head grill CHROME..
GOLD head grill HD03-GOLDM80 & M81 head grill GOLD..
GREEN head grill HD03-GRNM80 & M81 head grill GREEN..
ORANGE head grill HD03-ORNGM80 & M81 replacement grill ORANGE.. PINK head grill HD03-PNKM80 & M81 replacement grill PINK..
PURPLE head grill HD03-PRPLM80 & M81 head grill PURPLE..
RED head grill HD03-REDM80 & M81 replacement grill RED..
WHITE head grill HD03-WHTM80 & M81 head grill WHITE..
YELLOW head grill HD03-YLWM80 & M81 replacement grill YELLOW..